I’ve been looking forward to this next art for quite some time and have a really fun project planned for it! But first, let’s start at the beginning. Sure, chariots have existed for millennia, but they might be a bit hard to come by these days. The last time I had anything to do with them is building a model chariot back in Latin class in high school. Sure, it was fun, but hardly worth decorating with flowers. Needless to say, we’ll be playing a bit fast and loose with the concept of chariot, just like we won’t be hindered by the floral limitation, either! Car? Bicycle? Motorcycle?Â Public transportation via bus or train? Even a skateboard or scooter work. If you own the vehicle in question, customization and decoration is up to you, but public transit might be a little tougher. Of course, the city buses is Tallahassee (at least used t0) have some in the fleet with painted panels for different holidays and seasons, so there’s always that to look into. Either way, keep it legal, okay? I’ll talk more about cars since that’s what I’ve got to work with, but if you’ve got a bike, maybe it’s time for a new basket or set of saddle bags? Maybe you’ve got a horse that could use a new saddle blanket, come to think of it. 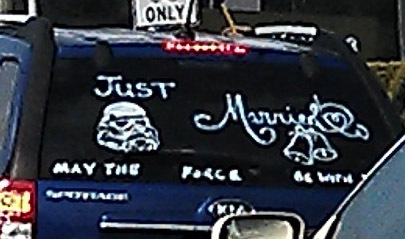 Probably one of the easiest ways to decorate a car–flowers or no–is with bumper stickers and decals. 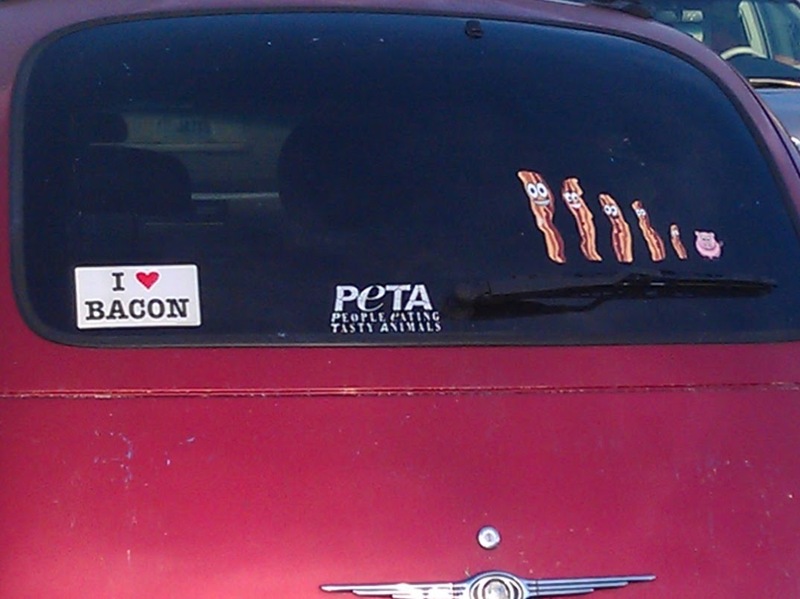 I admit, I’ve never wanted to put a bumper sticker on any car I’ve owned. Mostly for the same reasons I doubt I’ll ever get a tattoo: permanence just doesn’t sit well with me, especially if I’m espousing someone else’s ideas that I may decide I no longer agree with later on down the line. Sure, stickers come off, but that’s a step I don’t have to worry about if I keep them off my car to begin with. I’m just not sure I want my car to be a wheeled billboard for anyone but me. Vinyl decals are becoming more and more popular now than they used to be, and a lot easier to come by (which came first?). Is the proliferation of monograms on everything truly a “Southern” thing as I’ve been led to believe? I know I see an awful lot of monograms on the back of SUVs every morning on the way to work, and, of course, there are the ubiquitous family decals. Now, just because I get a chuckle out of the ones that show a spaceship attacking said stick-figure family doesn’t mean I can’t appreciate some of the more amusing options out there. Of course, decals don’t have to be run of the mill. Â A graphic artist I know designed this large-scale decal and had it professionally printed and applied to her car and I think it looks fabulous. So much better than just a personalized license plate, right? The only custom decals I have a head-tilt issue with are the ‘In Memory Of’ ones. I mean, I get planting a tree or dedicating a bench in memory of the dearly departed, but a car as a moving monument? Doesn’t compute for me. Partially because of how easy it is to bang up or wreck one, but there’s also a disconnect when I think about trading in a car for another. You just traded in the “memorial” to your granny and now someone else is going to drive around in it? Have you ever noticed them and do you think it’s normal or not right? Spotted in traffic: a cool congratulatory in windshield marker! Weren’t There Supposed to be Flowers? 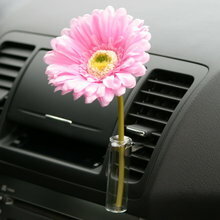 The first thing that comes to mind with the combo of cars and flowers are the clip-on bud vases that seemed to be introduced when Volkswagen revamped the Beetle several years ago. You don’t have to have a Beetle to have one of these clip-on cuties, but I’m not sure how well anything but faux flowers would hold up in the heat of summer trapped in a car. Still, if you were looking to surprise someone on their birthday or anniversary and timed it right, this could be really sweet! I thought that maybe succulents would work as car-plants but, again, temperatures might be an issue. Cacti might be a better option in the summer months, or maybe just stick with faux flowers. Paper and ribbon flowers might be a step up from the basic silks, but a nice touch is a nice touch. After all, we’re not decorating Rose Parade floats or anything, right?